Send this incredibly sweet Happy Easter treat to all your peeps! Incredibly cute and indescribably delicious this super cute gift combo is sure to be an Easter favorite! The hand painted woodchip basket is filled with scrumptious treats and includes a fabric keepsake tote. 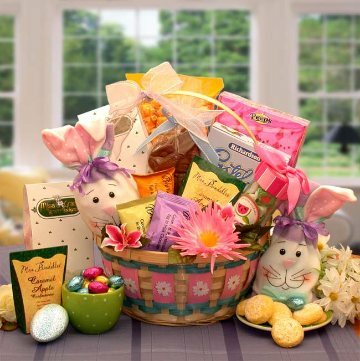 The It's An Easter Celebration Sweet Treats Gift Basket. This gift includes the following: 9" woodchip basket, fabric bunny bag filled with foil wrapped milk chocolate Easter Eggs, Mrs. Prindables Caramel apple stickies, Asher's peanut butter cream egg, Asher's coconut cream egg, Asher's marshmallow & caramel egg, Richardson's pastel mints, Marshmallow peeps, caramel corn, Ms Grace lemon cookies and delicious fruit taffy. Adorned with spring time flowers and a hand tied bow this gift is sure to make an impression. This gift weighs 4 pounds completed and measures 9" wide by 13" tall.